I felt like doing something different last night, and this is what emerged. 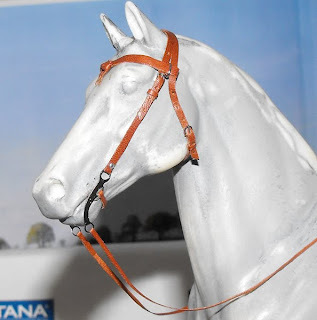 A nice basic working Western bridle. This is my first attempt at the split crownpiece (not sure if it has an actual name) and I'm pretty pleased with how it came out. Still loving the California/futurity knot browband - never see enough of those, in my opinion! Apologies to Ideal for making him wear a Western bridle - I have no other bodies. But he looks cute in it, don't you think?